This investigation is a Contribution of Pittman-Robertson Project W-107-R. There has never been a very detailed map of existing vegetation types of Texas statewide on a plant association level. Important broad and/or regional studies include those by Bray (1906); Tharp (1926, 1939); Cottle (1931); Dyksterhuis (1946, 1948); Allred, et al. (1954); Gould et al. (1960) and a map by Telfair (1983). Kuchler (1964) published a potential natural vegetation type map of the conterminous United States. Kuchler's map is a valuable contribution from both the standpoint of existing and potential vegetation of Texas, however, the scale is too small for many planning purposes. The authors did not consider potential vegetation, only plant communities existing at the time of the survey, including delineations of cropland areas. The map derives from the Texas Parks and Wildlife Department effort to categorize and map existing vegetation (habitat) types statewide using organized ground-truth procedures and recent technology involving Landsat (earth satellite) data and computer classification analyses. Classified Landsat scenes for the eastern two-thirds of the state were published from the period 1975 to 1981. The data were acquired from cloud-free overflights between 1972 and 1976. In the western one-third of the state, including the Trans-Pecos, western High Plains, and Panhandle portions, the computer classification was abandoned in favor of classifying the vegetation on previously delineated land resource units from a survey conducted by the Bureau of Economic Geology (BEG), the University of Texas (Kier, et al., 1977). The relative paucity of overstory vegetation in West Texas caused the computer classifier to map signatures of geologic features rather than vegetation, thus the change in methodology. Classification of BEG land resource units, which more often than not supported different vegetation, was accomplished by using ancillary vegetation maps, consulting with field biologists, inspecting sites, and plotting the types on the BEG unit boundaries overlying Landsat color-composite imagery, geometrically corrected at a scale of 1:250,000. Where vegetation types were the same on different resource units, the common boundary between the units was erased. BEG boundaries were further modified by the occurrence of cropland areas as shown by Landsat imagery and verified by using additional supplemental information. Landsat data used for this purpose were acquired during 1979 and 1980 overflights. The present map portrays information extracted from an assembled mosaic of photographically reduced vegetation maps classified according to the methods previously described. Such information represents a composite statewide summary of vegetation delineated from larger-scale maps. Limitations in delineating vegetation boundaries occurred as a direct result of reduced size and resulting decreased resolution. Areas having inclusions of various mixed types were generalized to the prevailing type. In other areas, vegetation types did not comprise adequate acreage to warrant portrayal without significant misrepresentation. Thus, streamside vegetation is mapped separately from upland vegetation where the occurrence is large enough to allow portrayal. For example, the riparian vegetation remaining within historically significant flood plains was frequently too small to map. Designation of map legend names conforms with the vegetation summary and may deviate slightly from legend names listed on the larger-scale maps. The vegetation types are depicted as associations of two or three plant dominants listed according to a physiognomic designation. The criteria for physiognomic classification are presented in Table 1 and on the map. In this accompanying bulletin are: (1) color photographs of each vegetation type depicted on the map, (2) commonly associated plants, (3) remarks on distribution, and (4) an appendix of plants mentioned and their scientific names. In most cases types have a single physiognomic designation, e.g. (17) Mesquite-Granjeno Woods. However, some types have two physiognomic designations separated by a slash (/), e.g. (25) Live Oak Woods/Parks. This means the type is encountered as either designation. It should be noted that the existing vegetation in Texas derives largely from land-use disturbance, and as such is heterogeneous with regard to composition. One of the most difficult tasks in conducting the entire vegetation mapping effort was to sufficiently define the floristic components which best represented the occurring vegetation types. Indeed, there are but few very distinct and easily definable pristine communities to be found. Thus, this work attempts to show the general picture; the legend name and/or associated species as indicated may not hold for any one area within a type, particularly in a type having widespread distribution with varying conditions of climate, soil type, topography or land use, the principal factors governing the distribution of plants. Beyond these limitations the map should serve for bench-mark information and also satisfy general planning purposes. Finally, reference is made to the Vegetational Areas of Texas as formulated by Gould et al. (1960), and here modified by the Texas Parks and Wildlife Department. These areas shown in Figure 1 and on the map, are often referenced in the remarks on the distribution of each type. Thanks are extended to Carl Frentress and Don McCarty, Texas Parks and Wildlife Department, for their efforts in the mapping and the field staff of the Wildlife Division for providing basic data and photography. Also, credit is extended to the Bureau of Economic Geology, the University of Texas, for use of their land resource units in mapping West Texas vegetation and for the map cartography. 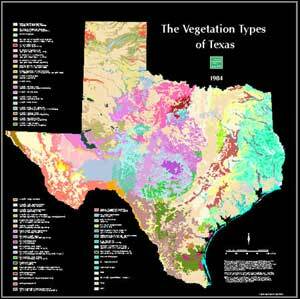 Copies of the Vegetation Types of Texas maps are available for PDF download in the sizes indicated.